Population growth on the I-94 corridor between Fargo and the Twin Cities metro area has accelerated in recent decades, putting development pressure on the forests, wetlands, farmland, and lakes around it. In Otter Tail County, that’s meant the waterways we all rely on to drink, fish, and swim have faced growing impacts. Fortunately, a local Otter Tail County resident has taken an important step to protect their land from development forever and preserve the region’s wildlife habitat with a conservation easement through the Minnesota Land Trust. Not only is this individual property important for migratory waterfowl and other wildlife, this land connects to other Land Trust protected properties, which collectively makes up a large protected complex of nearly 800 acres overall. “This land is a piece of a bigger puzzle, helping to create a large, uninterrupted stretch of natural habitat that’s important to Minnesota,” says Wayne Ostlie, director of land protection at the Minnesota Land Trust. 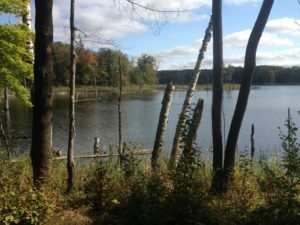 This permanent conservation easement was made possible by the members of the Minnesota Land Trust, with funding from the Outdoor Heritage Fund, as appropriated by the Minnesota State Legislature and recommended by the Lessard-Sams Outdoor Heritage Council (LSOHC). Thank you also to Jean Schilling for protecting this unique property forever.